This post is a little different from the others, as this is related to an experience that I had a little over a week ago. I had the chance to attend a business conference that encouraged me to continue offering my clients the BEST. This conference clarified some information that I received while I was building my business, but the concept of “training” was only a small part of the value I received while at the conference. Photo I took after I got back to my room. 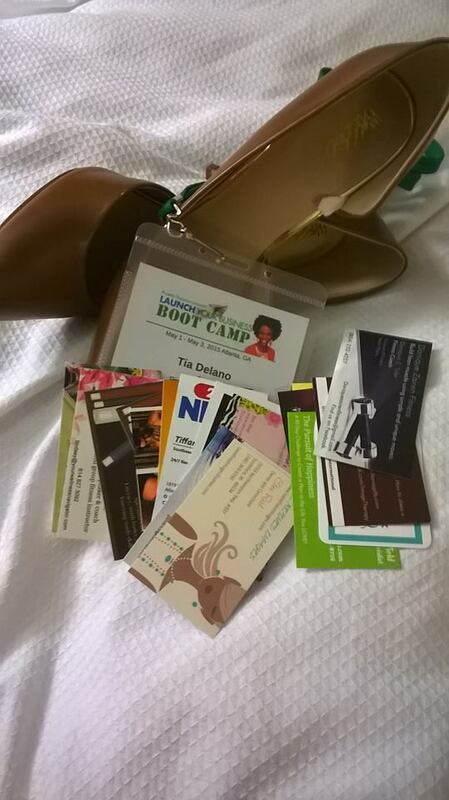 Each business card represents an amazing entrepreneur that I met while I was at the conference. I got the invaluable experience of CONNECTING with many likeminded women, all on similar paths, all working on taking their talents to those that need them most. I found these women SO encouraging and inspirational! There were entrepreneurs from all different walks of life, and all of us were putting the WORK into creating the lifestyles of our dreams, by offering our highest gifts to others. Not only were these women likeminded, but they were all so nice and positive. Everyone was kind and genuinely wanted everyone else to succeed. As a rule, I try to limit my exposure to “feel-good” rhetoric that is all emotion and little action. I was thrilled that the conference was NOT a bunch of endless chatter with no one actually DOING what they say that they want to do. Everyone in the room was committed to taking action, were already on their paths, and/or able to share how they have gotten tangible results from the actions that they have taken! Honestly, how many of us have walked away from an event and said, “Now THERE’S a group of folks taking action”? It’s a rarity, I assure you. I was delighted to see that this conference wasn’t a bunch of meaningless talk. The conference ended with the hostess offering the audience the chance for intense, targeted coaching that would guarantee success. Knowing that I have many obligations this year, I declined the opportunity. If I was willing to forgo some of those obligations, then I would have committed to the program. But in any case, I’m honored to have been in the presence of so many amazing women, and I’m so happy that I took advantage of this conference. Being in the presence of so many likeminded women was so inspirational, and I’ll cherish this experience forever. If you are interested in learning more about the conference, please visit the Happy Black Woman website and Facebook page for more information. I think you’ll find it very useful!